BALLOGRAF is a Swedish-owned company that manufactures ballpoint pens and mechanical pencils that are world class. It sells 50% of the products in the Nordic countries, while they export the other half all over the world. BALLOGRAF, a world-recognized manufacturer of pens and pencils, stands for Swedish quality founded on over 60 years of experience in manufacturing writing instruments. Production, from raw materials to the finished pen, takes place in Göteborg (Gothenburg). 4 million writing instruments a year are manufactured by only 30 employees. The company is Swedish owned and operated. allowed North American distributor of BALLOGRAF writing instruments and the Rosinco markers. We have been in business for over 20 years supplying BALLOGRAF pens to many gift shops and retailers throughout the United States and Canada. Shop online here! Nord Mark Inc. also offers the BALLOGRAF pens, refills, and other accessories to customers worldwide, who cannot visit any of the retailers in the US selling the BALLOGRAF pens. Rosinco eco-friendly markers are now available! 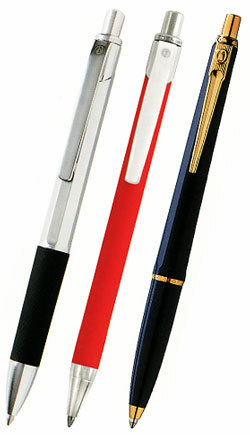 The BALLOGRAF pen’s writing characteristics result from the use of the best materials available. They make the ball of tungsten carbide. They make the point which houses the ball of stainless steel to withstand the wear and tear from the millions of rotations made by the ball during the life of the refill cartridge. They approve the ink in the cartridge for archival use per the most stringent requirements of ISO 11798:2000 (more stringent than ISO 12757-2), so it meets the highest requirements of writing durability, skip-free writing, and resistance to fading. The ink is also acid-free.BALLOGRAF products are covered by a lifetime warranty regarding manufacturing and material defects.